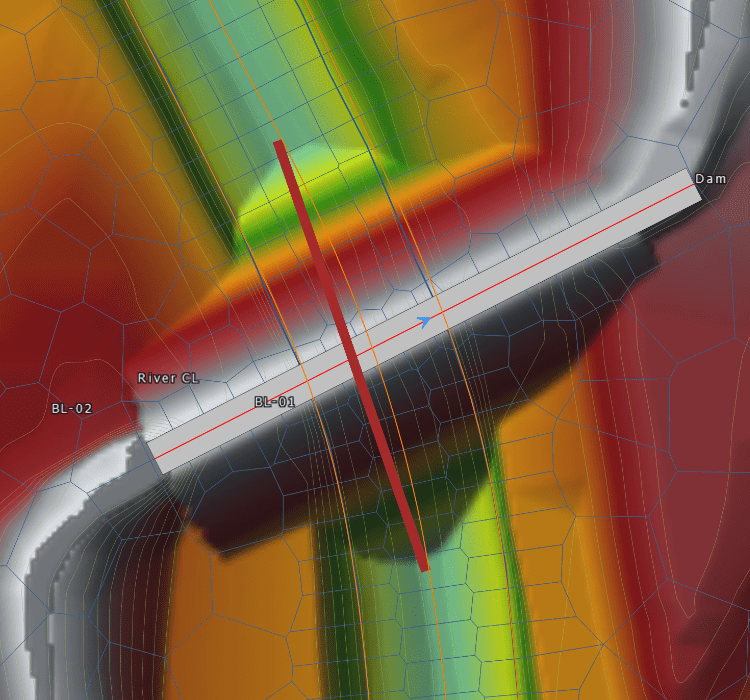 A flow area connection can be used to model a hydraulic structure between two adjacent storage areas, a storage area and 2D flow area, two adjacent 2D flow areas or within a single 2D flow area. 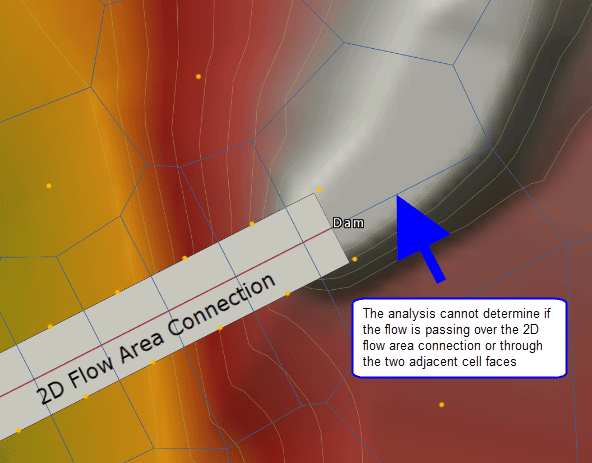 The flow area connection within a single 2D flow area represents how an internal hydraulic structure allows flow to travel from one set of cells to another set of cells. 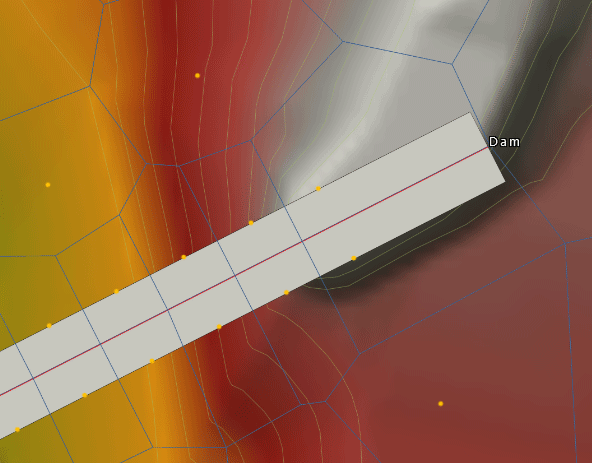 For example, it can be used to model a roadway crossing in the middle of the 2D flow area, or similarly, represent a dam structure within the 2D flow area. For an internal 2D flow area connection, there should be a breakline that coincides with the 2D flow area connection alignment. Breaklines are used to force alignment of the computational cell faces along barriers or other features that can significantly affect the 2D flow. 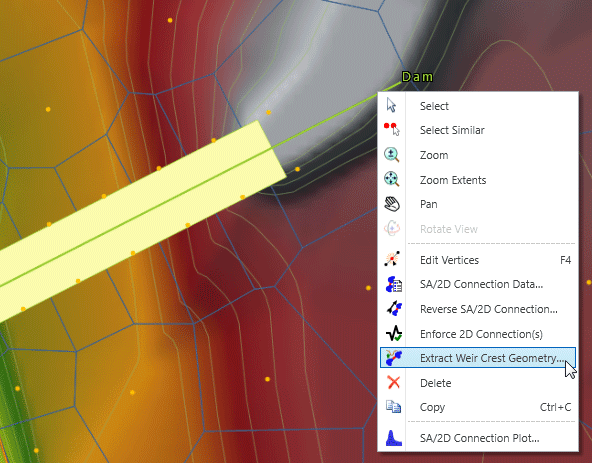 In GeoHECRAS, the software automatically makes certain that the 2D mesh aligns with the connection element by automatically inserting a breakline coinciding with the 2D flow area connection alignment. 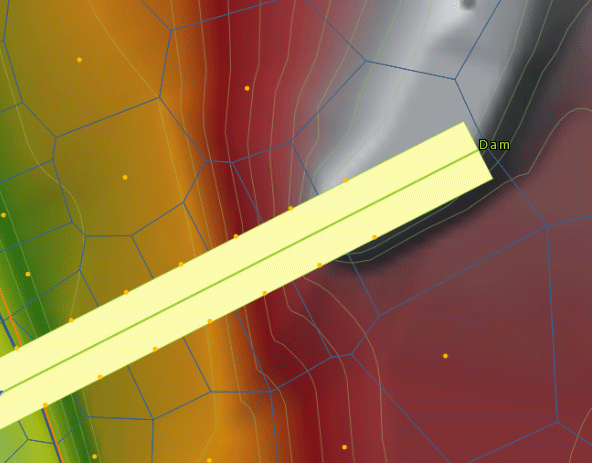 This insures that cell faces are aligned perpendicular to the flow going over the structure. This prevents flow from leaking through a structure if the 2D cell is large enough that it straddles both the upstream and downstream side of the structure. 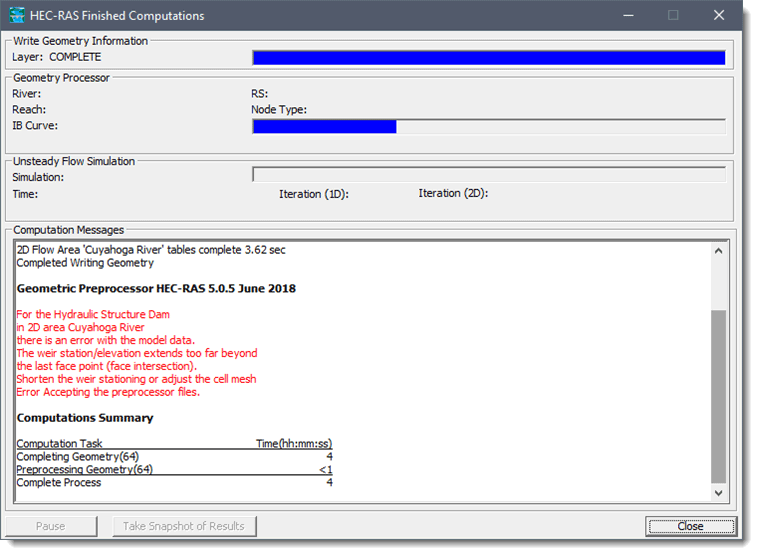 There is an error with the model data. 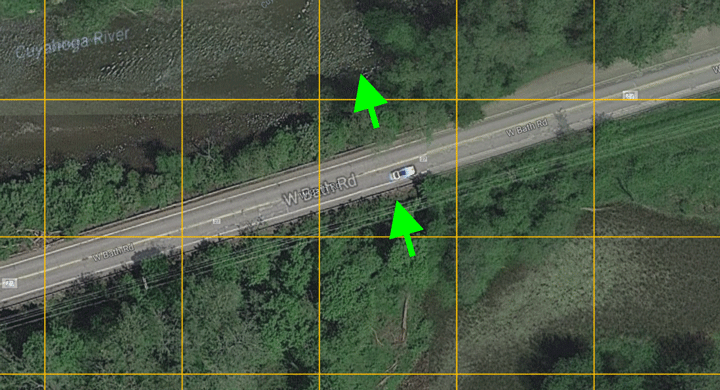 The weir station/elevation extends too far beyond the last face point (face intersection). This situation occurs when the 2D connection element does not cover a majority of the 2D cell face. This can cause confusion for the computational engine, since it cannot determine if the flow should be through the 2D connection element or between cells faces. This is shown below. By extending (or shortening) the 2D connection so that it occupies all (or most) of the cell face, the problem is resolved. 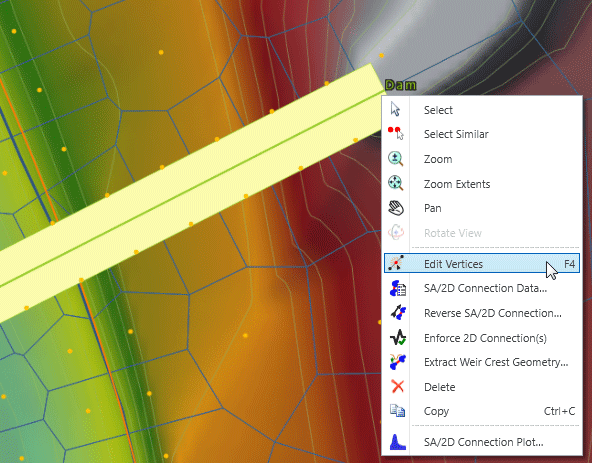 To edit the 2D flow area connection, select the element and then right-click and choose Edit Vertices from the displayed context menu (or press Function Key F4). 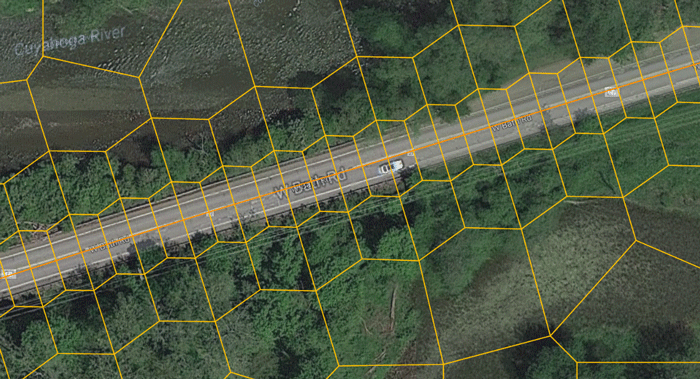 Next, grab the end vertex and resize the 2D connection so it covers the entire cell face. Then, right-click and choose Done from the context menu. Next, select the 2D connection and again right-click to display the context menu. 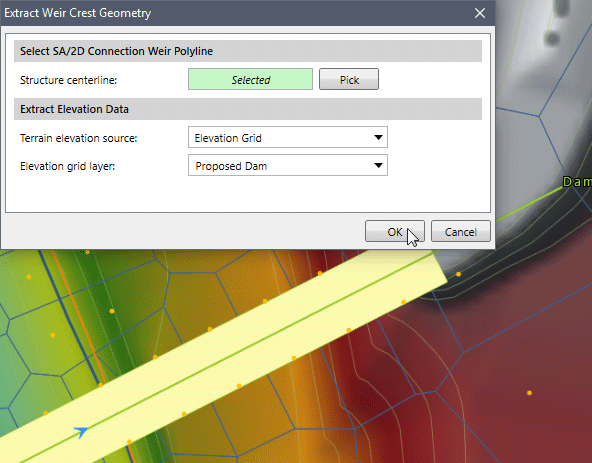 Then, choose the Extract Weir Crest Geometry command. The software will then display a dialog box, allowing you to select the terrain surface for extracting the weir crest geometry from. 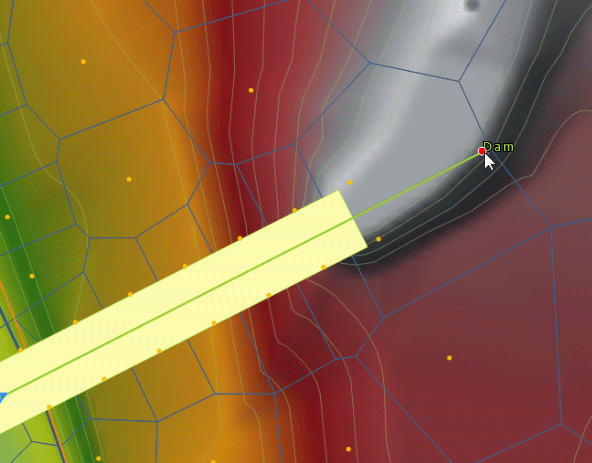 After clicking the [OK] button, the software will then update the weir crest geometry to occupy the cell face. Now the model will run successfully.